I didn't want you all to forget me, so I'm posting a few teasers today. As I said, I've been way too busy, but have dabbled with a few things. Above is my ongoing back-basting applique project. I just couldn't stand it any longer and had to get some of the blue flowers on it yesterday! And above is my joke challenge quilt. The theme is Butterfly Fantansy. Butterflies are beautiful in real life, but I don't care for them on quilts or "things" - just too cutesy for me. I really thought about making a quilt with dead butterflies on it and with words saying "Dead Butterflies are the Best Butterflies". But then I thought it might be a bit too bitter for some ladies - so I did a toned down version for a joke. You'll see the whole thing after Wed night. And then these last "pieces" are my real challenge quilt. I"ve shown Laura a picture and she loved it. Nothing like getting this whole thing made, quilted and bound in a week! I"ll leave you wondering and with these peeks. 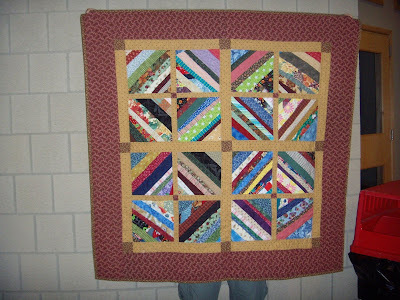 Thurs I"ll share the full quilt! All the surprises from my 500th post give-away have arrived! I hope the winners have many happy hours enjoying their goodies. Feel free to go check out their goodies! 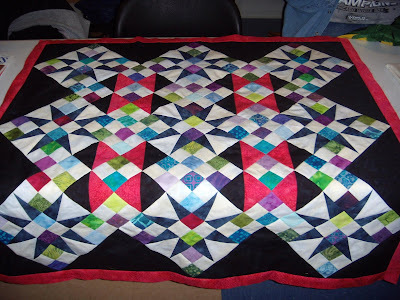 I"ve been so busy with work and what time I have had at home the last week has been spent trying to make my guild challenge quilt. Yes - it is due Wednesday and I started it just this past week! Nothing like the last minute to kick me in gear! So I can't share pictures yet - but I will be able to in a few days! Oh and to make things harder I had a touch of a bug this week and was sooo tired and dragging. I guess all the work I"ve had hasn't helped that! Well I"ve slept many more hours than I"ve been up the last few days and am starting to feel better! Thank goodness! Judy at Quilting with Ragdolls got her 500th post surprise yesterday in the mail! She made my small gifts look so lovely on her blog! Go check out what I had been busy doing! I also know Christine at Libery Star Farm got her package yesterday and she mentioned that her 6 yr old wanted to knab the small quilt for her dolls! Christine quickly grabbed it back! The other 3 winners live "across the pond" so it will take a bit more time for theirs to arrive! It sounds as if you ladies enjoyed your goodies - I"m really glad. They were gifts from my heart to yours! And the winner is...... Christine at Liberty Star Farm! So send me your addresses and I"ll be getting the packages in the mail! Oh and by the way Hedgehog.... Emily was so excited to pull your name. Last week for math class she made "Perry the Hedgehog" for the math fair. It was made from styrofoam with dum dum suckers stuck in the body for the spines! The teacher loved it so much she kept it for the classroom to hand out suckers when she felt like it! Chloe is jumping for joy! The big 500! It is finally here, the 500th post. My family has been making fun of me all morning about this. But not Chloe! She is jumping for joy! So leave a comment on this post and your name will go into the drawing. The prize is a surprise, but I guarantee it is fun and quilting related. I"m hoping Jenna (who is home for spring break), Emily and Chloe will draw the name sometime Wednesday night after 6pm Central time. But since they are making fun of this I may have to resort to a random number generator. Why is Chloe hyper? Because this is post 499!...... You know what that means for the next post! And I caught up with the civil war blocks! Just in time for next weeks new ones! Oh these are so much fun to make! Its been busy, busy, busy at work this week, so just a few Civil War blocks I got done this week. The one above, was suppose to be all black and red on the outside corners. I got the first black strip on and then was doing this so late at night I forgot and put white instead of black! Oh well, I kind of like it so it is staying this way! 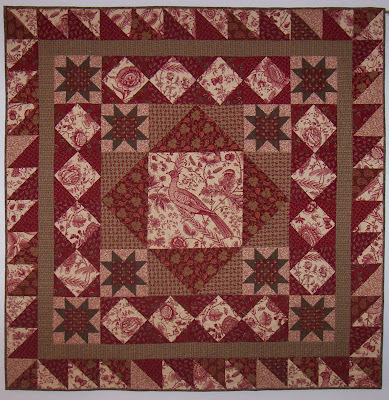 Williamsburg Medallion Top finished - and a few more CW blocks! I finally finished Marcie's Williamsburg Medallion top! Now to figure out how to quilt it! I flipped the way the HST border went to give it more light space and then a more definate darker outline. Doesn't it look fun! I had told Marcie the other day that this pattern would make an awesome baby quilt if you had the right baby fabrics, don't you think! And here is a Civil War block I made last night called Panic. Ummmmm do you see anything wrong with it! A lack of sleep, too much work and stress and this block said "PANIC"! I thought about leaving it, but ummm, I couldn't do it! So I did fix it! 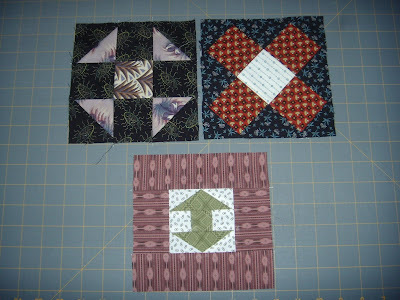 Below are a few more blocks I got done! I have so much to show you! So I guess I"ll just share some today and the rest later. 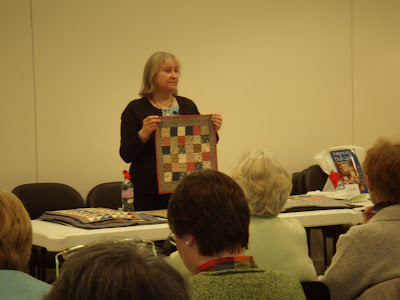 Yesterday was my class with Kathleen Tracy and the Broken Dishes quilt from her Prairie Children and their Quilts book. It was so much fun! Kathy is so down to earth and not a perfectionist - I liked that. 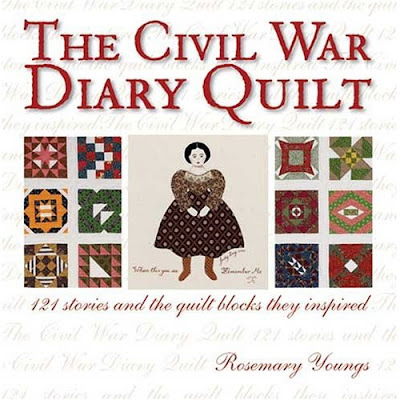 You can tell she really loves those old diaries of women back on the prairie and making these quilts for fun and enjoyment, not prize winning. That made it so much fun. While we sewed she read to us some passages of a series of books "Covered Wagon Women" that the author Kenneth Holmes had collected and published old diaries of women from the wagon trail. It was so interesting. She also mentioned she is thinking of starting an online group and and an online doll quilt club type thing. She was wondering if there was interest in such a thing and I said I know several people who would probably love it! So keep an open for it on her web site if you think you would like to do it. So here is my finished top! It had a different border fabric, but Kathy had brought this homespun with and I really liked the way that looked instead of the print from the kit - so I used this! And I threw in the tan/brown checked fabric to give it a bit more brownish tint. I"m really happy with it! And here is what I made from all the little scraps of fabric from the kit! Adorable isn't it! 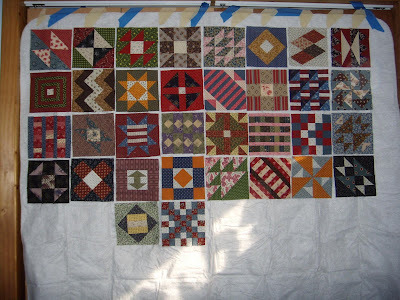 And here is a new batch of Civil War Blocks! I still have many more to go to catch up with this week! But at least I"ve made progress! Above is my most used pincushion. Not the fanciest, but certainly most used! It stays by my machine and goes with me on retreat! I know I've shared some of my others in the past so I won't bore you with more pics of those. Blueberry Lane is having a giveaway of an old pincushion book out of print for sharing your most used pincushion. Go visit! 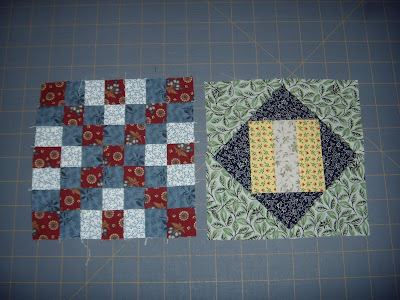 And here are some Civil War blocks I got done this week! The top 2 are my favorites! And I even bought a cheap tablecloth to tape up on Adam's closet for a design wall finally! It is so fun to see the blocks all together! I have a lot of red and blue ones I decided. I'll have to fix that! Just a short break from my progress on Marcie's Williamsburg Medallion to share a few other things I"ve done in the last few weeks. 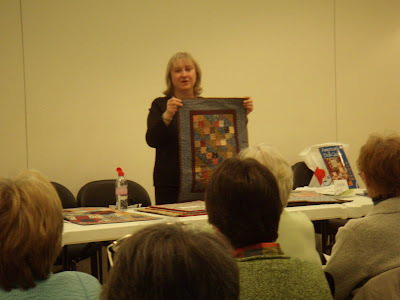 First off was last night's guild meeting speaker - Kathleen Tracy, author of American Doll Quilts and Prairie Children and Their Quilts. 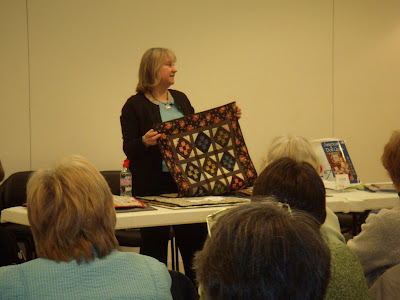 Oh what fun that was to see all the quilts in her books in real life. They are so pretty in real life. She told us how she got started quilting small doll quilts for her daughter and how she ended up writing her first book. She told about life around the period of each doll quilt. It was a very fun speaker. And we found out she is working on a new book! I don't remember when it will be out, but there will be one. 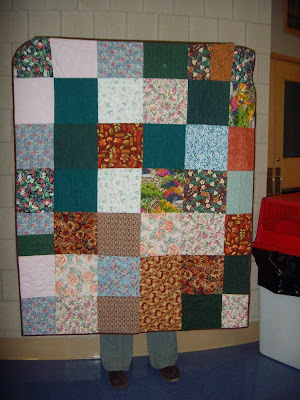 I believe the next one is going to have bigger sized quilts in it! Darn on my camera, I couldn't get a good shot of the quilts for anything. It was one of those nights! 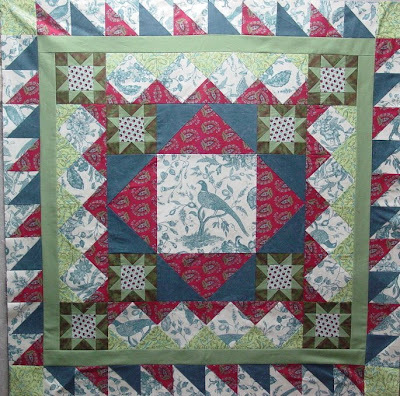 But Saturday I"m making her broken dishes quilt from the Prairie Children book with her! How fun will that be! And here are the 2 scrap quilts I made a few weekends ago when I wasn't feeling well. 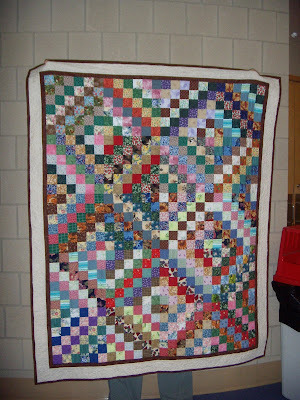 They are all quilted and bound and given to charity last night. You all know how to do the string ones, and the trip around the world one is from Bonnie's pattern - Scrappy Trip Around the World. Oh and on that one I did Bonnie's 10" block scrap backing! Then like I have nothing to do these days, I ended up saying I would be on the raffle quilt committee 3 weeks ago when our old committee all up and resigned after about 5 months of not starting the quilt. So Joan, Julie and I (and I think Nan is going to help) have been getting organized and picked the colors and bought the main fabrics. 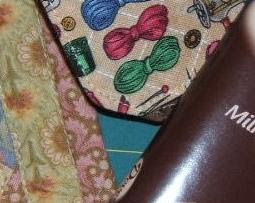 The guild members will be donating FQs of the scrappy fabrics. 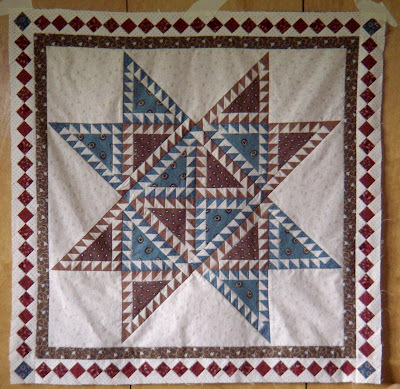 Bonnie had given our guild permission to use her Cathedral Stars pattern. 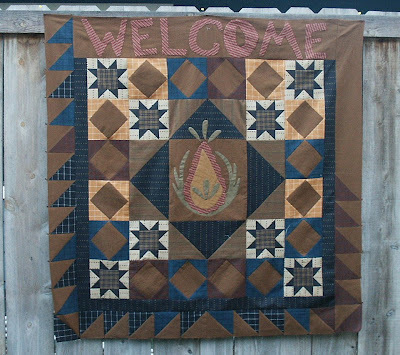 So Julie mocked up (from her stash I might add) a small version of the quilt so the guild members could see what the color theme we decided on would look like. Doesn't it look great! Pattern revealed (but not finished)! So here is the next round to my project! Isn't this turning out funky fun! Have you guessed what pattern it is? Well I have one small border and then the big outer border to put on yet, but I'll share it with you - because it is so fun. 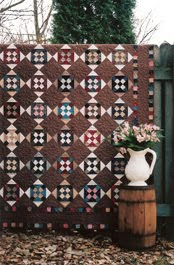 It is Marcie's Williamsburg Medallion Pattern! 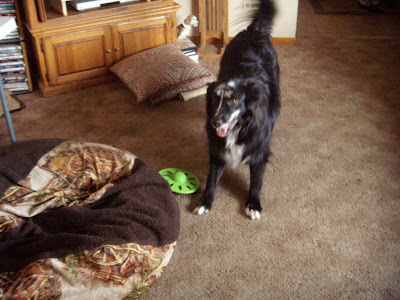 Look how different Marcie's looks compared to Libby's compared to mine! Isn't it fun to see how fabric and the center can change the look? It will be a few days before I get to finish the last border, so check back in a few days to see how I finish mine off! 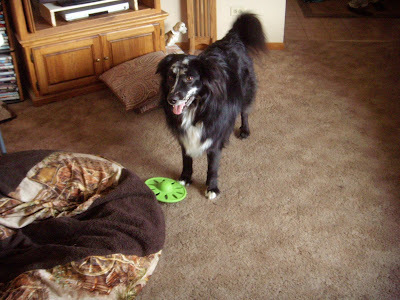 I still have one more surprise with it for Marcie! Oh my gosh! And look at Karen's version! Is this now awesome colors too! And I love what she did with the square in the square round.